Autumn joined the DAHLC 2 years ago when her husband accepted a position here at Mayo Clinic. Before coming to Rochester, she was a golf professional and frequently exercised. Autumn became a stay-at-home mom after having a son and started realizing how much her body had changed. People kept telling her she would lose the excess weight eventually since she was in such good shape before. But for her, something needed to change, and she was determined to get healthier. Autumn knew that she needed to pay closer attention to her nutrition and increase her strength to reduce her body fat, so she started attending drop-in group fitness classes and doing her own workouts. Although this was helpful, Autumn wanted more and decided to sign up for an evaluation with a Health & Wellness Coach to learn her body fat percentage and other numbers. She then proceeded to sign up for a Strictly Strength group training class. "My first class all I could think was “what did I sign myself up for?! There is no way I can lift that much weight!” This was going to be a challenge but that is why I am doing it right? Not only did I challenge myself but I developed some great friendships with others in my class and my coach. The combination of a great challenge and awesome people to train with has helped keep me extremely motivated." Little did Autumn know that she would be lifting 200+ pounds and feeling stronger than ever. She started by keeping her goals small and attainable until she found herself beating her own expectations. She realized that there would be setbacks during her fitness journey but that she would account for that and not be so hard on herself. "Bouncing back from those set backs is what makes hitting your goal that much more satisfying. Having a great support system of friends and coaches are important to hitting those goals. It’s fun to be there to support your friends when they hit their goals too!" Autumn's words of advice: "If you are just beginning, set a consistent day and time that you will make it in to exercise. It could be just walking for 30 minutes, trying a drop-in class, or setting up an evaluation which are great ways to get started. I think having accountability is huge to achieving success. Tell people you are going to work out, invite a friend to come with you, meet people in a class and workout together. If you see me, I always enjoy working out with people. Set a goal that is attainable and don’t be too hard on yourself!" 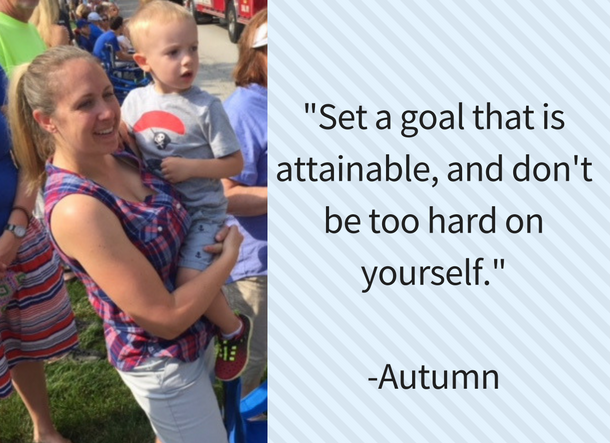 Thank you for sharing your journey with us, Autumn! You're a rock star! To get inspiration from other members, click here.